WHQL and ready to roll for the September 27 release. When you're finished pre-loading Forza Horizon 3 (for those of you who pre-ordered the title), you can go ahead and grab Nvidia's latest Game Ready driver release, version 372.90, which is intended to deliver the "best possible gaming experience" for the cross-platform racing game. Unless you're running an AMD-based graphics card, that is, in which case keep your eyes peeled for a Crimson update. [SLI, GeForce GTX Titan] The Mirror's Edge Catalyst Intensity slider is shown as grayed out after filter type is changed to None from Custom. [Start Wars the Old Republic] There is flickering in the game. [Rise of the Tomb Raider] The game crashes after extended gameplay. [NVIDIA G-Sync] Games lag when played in windowed mode with G-Sync enabled. [NVIDIA G-Sync] [World of Warcraft] Screen tearing occurs in the game when in-game V-Sync is enabled. [GeForce GTX 1080] [HTC Vive] The GPU is not lighting the headset when connected over the DisplayPort. [NVIDIA Ansel] Ansel to be enabled by default in the driver for white-listed games. [SLI, UEFI] Event Viewer error 14 points to nvlddmkm when the system is rebooted. Beyond the above, this is a relatively minor driver release. There are no 3D Vision or 3D Compatibility Mode profile additions or other noteworthy upgrades over the 372.70 release. 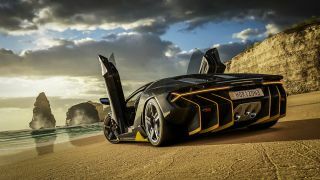 As for Forza Horizon 3, the title releases to PC and Xbox One on September 27. In the meantime, you can check out a launch trailer that Microsoft Studios posted yesterday, along with a set of system requirements (revealed a few weeks ago) to make sure your system is up to snuff.